Following the 2012 surprise hit Pitch Perfect, and the inevitable but still enjoyable 2014 followup Pitch Perfect 2, Pitch Perfect 3 should have ended this series with a bang, but instead it just sort of fizzles out. At the start of this third instalment, the original Barden Bellas have now left the group after graduating from college, with the girls having all gone their own ways. Beca (Anna Kendrick) is doing work as a record producer, and Fat Amy (Rebel Wilson) is now working as a street performer, leaving Emily (Hailee Steinfeld) to be the new leader of the Bellas. But when they are given an opportunity to perform on a European USO tour, thanks to Aubrey’s (Anna Camp) father being in the Army, the a cappella group get back together one last time, but not without some unexpected twists along the way. The winner of the tour will be chosen to open for DJ Khaled, but they face added pressure as they are going up against several highly competitive groups that use musical instruments. This is a film that I really wanted to like more than I did, but it’s just not that good. The globetrotting premise feels tired and clichéd, and it’s got a weird action movie finale on a boat involving Fat Amy’s sketchy father (John Lithgow) that feels like a strange place to take the franchise, and doesn’t really work at all. Anna Kendrick has an always likeable screen presence, and there is some fun interplay between the characters, but for the most part the cast here just seems like they are ready to move on to other things. There are a handful of decent musical performances, and some fun moments here and there, but the film as a whole ends up feeling forced, like they are just going through the motions one last time. It’s still worth a look for fans of the series, but Pitch Perfect 3 unfortunately fails to live up to the first two films, and lacks much of the sparkling energy that made them work. I like the Bellas, but I really wish that this film had provided a better sendoff for them. It does the job if all you want is some lightweight escapism, but it’s not exactly memorable, either. The Blu-ray also includes two commentary tracks, the first with director Trish Sie and the second with producers Paul Brooks and Max Handelman, as well as several new and extended musical sequences, a deleted scene, a gag reel, an official music video, and a selection of nine short featurettes. They are Competition Crescendo, A Capella Action, The Women of Pitch Perfect 3, Don’t Mess With Rebel, The Headliner: DJ Khaled, The Final Note: John and Gail, Just Because He’s a Bad Guy…, The Final Performance and Hollywood of the South. 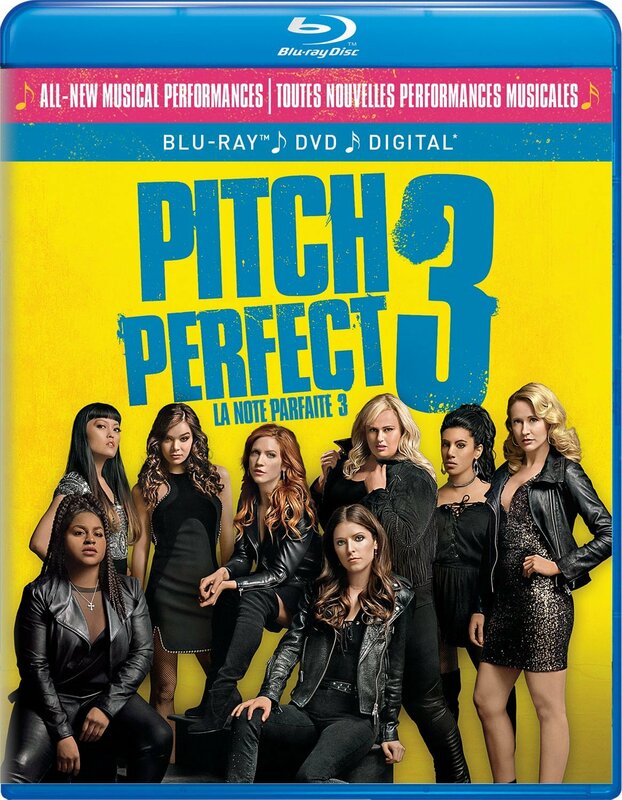 Pitch Perfect 3 is a Universal Pictures Home Entertainment release. It’s 93 minutes and rated PG.